To celebrate the release of Bridget Jones's Baby in cinemas September 22nd, I'm giving you the chance to win big with double passes to see the comedy and a Bridget Jones's Baby bag! The much-anticipated third installment of the Bridget Jones’s franchise welcomes fellow Academy Award®winner Emma Thompson to the cast. Longtime collaborators Tim Bevan and Eric Fellner of Working Title Films produce alongside Debra Hayward. Universal Pictures will distribute Bridget Jones’s Babyin North America and select international territories. 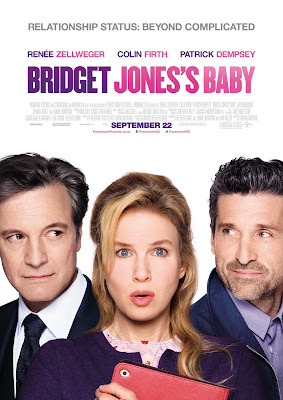 Bridget Jones's Baby is in cinemas September 22nd. To enter simply email to this address: darrensworldofentertainment@gmail.com - simply CLICK HERE darrensworldofentertainment@gmail.com and in the subject line put BRIDGET. NB Competition closes 22 September- editor's decision final!